It all started 4 and a half years ago in a coffee shop in Maidstone, Kent. Graham Beadle, a local comic shop owner and a group of artist friends decided to get together and hold a sketch day for a few people. 100 people came through the doors of the coffee shop that day, they soon realized that next time they would have to go big. 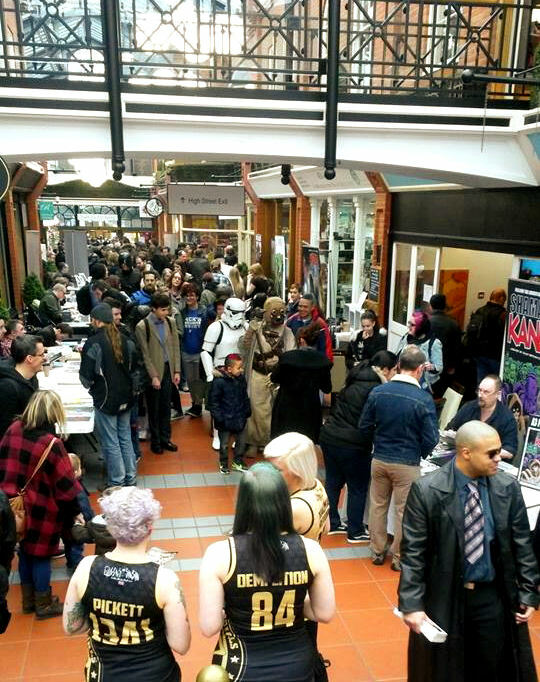 Demoncon has been held at the Royal star Arcade in Maidstone for a year and a half now, with the conventions being held bi-annually. The arcade itself is beautiful with natural lighting and enough space for the artist tables either side and a large walkway that allows adequate space for the flow of people. Walking through the doors you are greeted by two friendly gentlemen sitting at the ticket stand. Prices are £7 for an adult and £3 for a child, with children receiving a free comic book of their choice. Walking in the first thing you notice is the abundance of small children and families in cosplay. There seem to be more children than usual, and I couldn’t help but think this was a brilliant starter convention for a young cosplayer as the smaller venue meant it was less daunting and their efforts could receive the attention they deserve. 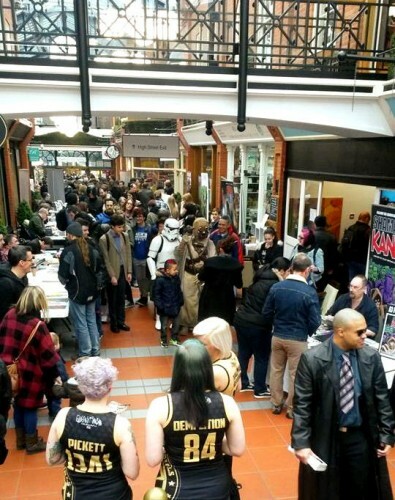 While Demoncon is not the largest convention in the UK, it is by far one of the best. Artists, writers and shop owners from around the world have come together to create a personal and family friendly environment whereby advice and autographs are freely given, as well as allowing newer artists, such as Vic Iddstar Hill, a platform to promote their work for a small table fee. There is a real sense of community walking around, all the stall holders are incredibly friendly which was made most apparent while talking to Grant Perkins, artist for 2000 AD, Future shocks, and Titan comics to name a few; “we are all family here, if someone needs help promoting their work, we will help, we all started out once”. 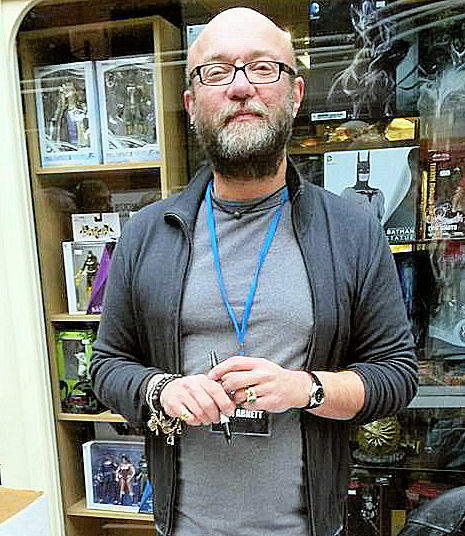 Full of free advice and smiles, Dan Abnett. It hasn’t always been all sunshine and rainbows for Demoncon, this year saw a dip in numbers due to printing errors for leaflets and various other last minute hiccups, something that Graham, Demoncon creator and owner of The Grinning Demon comic book shop, seemed a bit disappointed with when we spoke. However, talking to other guests and artists it seemed that despite the fact Graham saw it as a poor turnout, everyone was praising Demoncon. Demoncon has provided an excellent location for people that are just starting out in the comic book industry. While talking to Graham, although he felt he had not personally helped anyone to achieve their goals, it was obvious to me that he didn’t realise how many people he was inspiring with his event. I asked what advice he would give to someone wanting to start up “it’s like a starter con, you can go out and get a feel for what you should be doing, learn from that and move on to bigger cons from there”. Prices for tables were very reasonable, with £30 for a first time table and £20 for returning artists, with the cost of the tables soon made up by selling your wares. Altogether I thoroughly enjoyed my day out at Demoncon, it was everything that was advertised, a family friendly event for everyone, whether you are and avid geek or just someone in the local area curious as to why there is a Cyberman trying to shoot the Doctor on Maidstone high street. The close up experiences and friendly attitudes of guests set it apart from some of the bigger conventions and I was pleasantly surprised to hear that Graham has no wish to expand the con further as it would loose that personal touch that set it apart from the others. Demoncon is the quiet kid at school that put its head down, did its homework and found its calling. Look out for announcements regarding Demoncon10! Its going to be epic. From Kent, England, Farleigh is part duck part milky bar. A Cosplaying mother by day, Grammar nazi by night, Farleigh enjoys writing, event coordinating, camping and cheese. 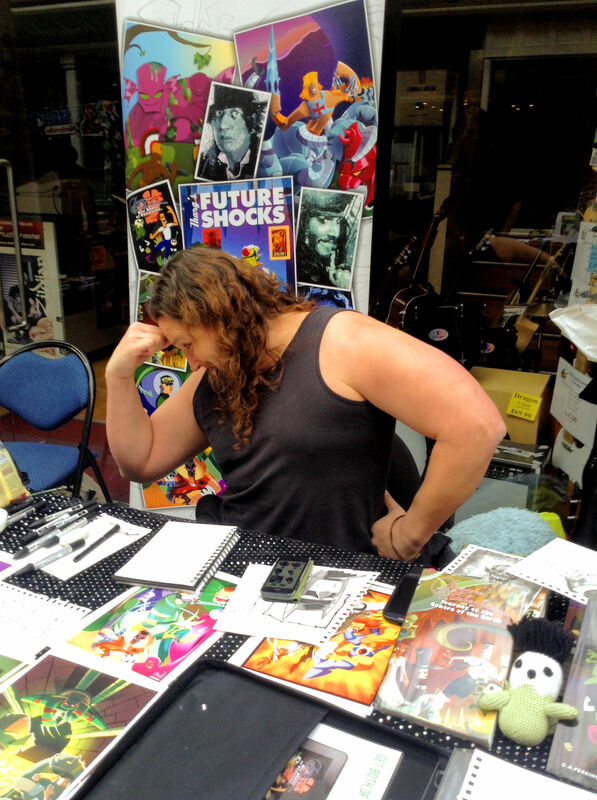 MancsterCon 2013 – Local talent wins again!